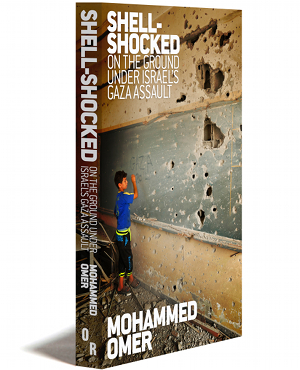 Mohammed Omer is an award-winning Palestinian journalist whose reporting has appeared in media outlets including the Washington Report on Middle East Affairs, Al Jazeera, the New Statesman, Pacifica Radio, Electronic Intifada, and the Nation. At just three months old, my son Omar cries, swaddled in his crib. It’s dark. The electricity and water are out. My wife frantically tries to comfort him, shield him and assure him as tears stream down her face. This night Omar’s lullaby is Israel’s rendition of Wagner’s Ride of the Valkyries, with F-16s forming the ground-pounding percussion, Hellfire missiles leading the wind instruments and drones representing the string section. All around us crashing bombs from Israeli gunships and ground-based mortars complete the symphony, their sound as distinct as the infamous Wagner tubas. But unlike a performance, this opera of death lasts days. Audience applause is replaced with the terrified cries of babies and children shrouded in smoke. Shrapnel zings off buildings and cars as another missile finds its mark, landing on another home. Six more are now dead. A doctor’s house next door was hit by three Israeli F-16 missiles. It’s hard to know what the target was. The doctor was killed, joining his mom and dad, killed in the previous war in 2008–09. The air strikes are buzzing in my ears and Lina’s. Omar’s crying is continuing. Now the death toll is at 186, with 1,390 injured. The majority of them are civilians, as reported by the UN. There is no end in sight. Beyond the border we see tanks amassing, preparing for a ground assault. Above, the ever-present thwup-thwup of hovering Apache helicopters rocks Omar’s cradle through vibration. Warning sirens pierce the night—another incoming missile from an Israeli warship. The border is not far. But we cannot leave. 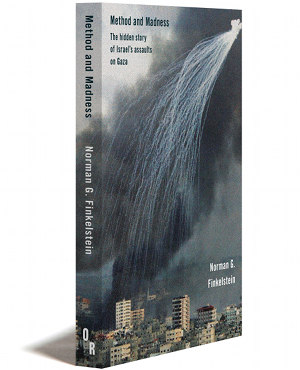 The Gaza Strip has been under siege since 2007. Unlike Israel, we do not have bomb shelters to hide in. The 1.8 million citizens of Gaza, over half of them children under the age of 18, are packed into an area the size of Manhattan, unable to leave. We must stay and pray, pray that we don’t get hit. I’ve been through this before. I grew up in Gaza. But this is my first time under fire as a parent and husband. It is a wholly different experience. I wish I could airlift my wife and son out of here. But this is my beloved ancestral home; what else can I do? The air strikes are too loud and unending, it seems. In a moment of nervous quiet, Lina breast-feeds Omar and quietly prays. Crash! Boom! Another air strike smashes into the ground outside our home. Lina darts out of the room, shielding Omar in her arms as she seeks safety on the other side. Omar screams, and screams and screams. It’s piercing, enveloping me in a horror only a parent can understand. I find it impossible to comfort him, holding his tiny hand as he lies in my wife’s arms. Lina is clasping Omar tight. We nervously jump from room to room scanning the skies for incoming missiles. Israel always claims they are precision. Precision? Then why are so many children, women and elderly injured, maimed or killed by them each time? Why is the hospital bombed? Why schools, bridges, water treatment facilities, greenhouses and other civilian targets? The statistics always tell a different story. Boom! A flash of white and another crash. The stress is debilitating, fostered by the constant of buzz of drones. It haunts us as we search for anywhere safe, but there is nowhere safe. We watch, waiting. Another volley of Hellfire missiles shakes the building. No rest. No sleep, but we are lucky we are still alive. I open and close the refrigerator door. The electricity is out, but it makes me feel normal. Lina tries to sleep, catches a few minutes and wakes up trembling. This is what it is like to be under attack in Gaza, and we don’t know for how long or when it will end. We talk, looking for distraction, wondering how the Israelis are doing on the other side of the segregation wall. They are free to come and go as they please without restrictions. Do they feel safe, with their warning sirens and bomb shelters to hide in? They don’t have to worry about warships pounding their homes, tanks smashing through their streets, bulldozers destroying their homes, jet fighters dropping bombs on their neighborhood or drones hunting them down. Israel has the fourth-most-powerful military in the world, with a full army, navy and air force as well as their Iron Dome, which is quite effective against the homemade rockets lobbed from Gaza. We have no navy, no air force and no army. We have no checkpoints for security. We don’t even seem to have a right to exist or defend ourselves. That right, according to the United States, seems reserved for Israel and Israel alone. Pondering this hypocrisy elevates the cognitive dissonance of the situation to new heights. We’re a mere hour’s drive from most major cities in Israel, yet we live in a completely different world. Gaza is the Lodz, Krakow and Warsaw ghettos rolled into one. We cannot leave or enter without Israel’s permission. Israel tells us what we are allowed to eat, raids at will and often decides which products we’re allowed to have, down to toilet paper, sugar and cinderblocks. It arrests our children, fathers and mothers, and can hold them as long as it wants. Its snipers amuse themselves at the expense of our children. How can Israeli society not know what we are suffering or what they’re paying to have done to us? Didn’t their parents or grandparents go through the same horror before coming to Palestine? Wasn’t Zionism created to prevent these horrors from occurring ever again… to any people? Despite the desperation, Gaza is my home. Wherever I go, however long I have to wait at checkpoints, to leave or return, sitting under the hot sun or arguing with officials about the abuse of travelers and victims, I feel a deep joy and love when I pass through Rafah gates, for I am home. I have options, given my Dutch citizenship. As the bombs continue to fall, I ask myself if I should take my family to the Netherlands, where my son was born, press on with my PhD studies at Erasmus Rotterdam and Columbia University and try to forget the F-16s and nightmares Israel reserves for us.But I’m a journalist, and I owe it to my people and the Israeli people to get to the truth. I choose to stay in Palestine, my beloved home, with my wife, son, mother, father and siblings. I am not willing to let Israel or Zionism exterminate me. Since 1947 Israel has disrupted our lives. My family and I are the wrong race and wrong religion, so the state doesn’t want us here. This is my home and, steadfastly, I will stay. It is my right as a human being and our right as Palestinians or Israelis, whether we’re Jewish, Christian or Muslim. Ultimately, we’re all human. 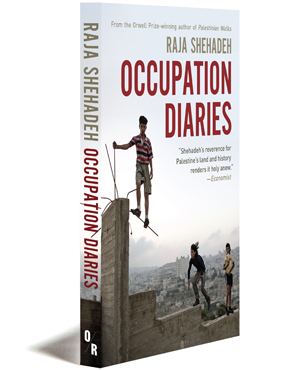 “Gaza is still struggling to survive.” MOHAMMED OMER interviewed on Democracy Now!